Figure 1. 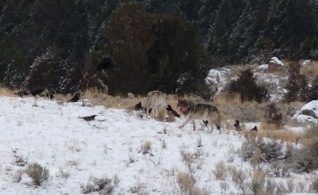 Wolves feeding on a prey killed just outside Mammoth Hot Springs, Yellowstone National Park. The unavailability of weak prey may push wolves to use specific habitats that help them to kill their prey, such as open habitats covered with snow. Photo credit: Alessia Uboni. Figure 2. Visual depiction of the extent to which wolf territories overlap among years. Panel A represents low overlap between the winter territories of the Druid Peak pack for years 2001 and 2007, while panel B depicts high overlap between the winter territories of Leopold pack for years 2002 and 2007. The height of the peaks symbolizes the intensity of use of each area of the pack's territory. Photo credit: Alessia Uboni. An animal's needs change throughout the year. For example, the needs of a female are not the same when she is nursing her young or when she is alone. When she has the young, she needs to hide more, she might move slower if the young follow her, and she need to search for habitats that can feed both her and her young. The available habitat may change both among seasons and among years. For example, meadow vegetation is available to grazers in summer, but it may become unavailable in winter, when plants die and the snow covers the ground. Consequently, grazers may move to different habitat and search for food, for example, in the forest. Additionally, the availability of meadow vegetation in the fall may vary among years based on weather conditions. If the snow arrives earlier than usual in one specific year, then grazers may need to change their habitat selection, i.e. move from the meadow to the forest, earlier than usual. Lastly, the available resources may also change both among seasons and among years. Wolves are predators that select prey based on their body conditions and health. When prey are healthy, for example after the summer when they have gained weight to face the winter, wolves may have a difficult time to find a weak prey and may rely on specific kinds of habitat that help them in killing their prey (fig. 1). When prey are weak, for example after a harsh winter, wolves may hunt in any place, because prey are easier to kill. Despite the obvious drivers that may cause variability in habitat selection, many studies on wolf habitat selection separate their analysis only between summer and winter and do not consider that habitat selection may vary between years. In this study, my collaborators and I aimed to assess if wolf habitat selection varies among summer (April-September), early winter (October-December) and late winter (January-March), and if it changes among years. Afterwards, we determined which factors might drive interannual variability in wolf habitat selection. We used 13 years of data derived from hundreds of thousands of GPS locations collected from radiocollared wolves to map wolf territories in Yellowstone National Park. Then, we mapped habitat features such as elevation, slope, vegetation type, openness (i.e. an index describing how open an area is, a forest would get a low value while a meadow would get a high value), distance from rivers, distance from roads, snow, and prey distribution. Afterwards, we related the GPS locations to the habitat maps in order to determine if wolves selected certain habitat characteristics disproportionally compared to their availability. We then compared patterns of habitat selection among seasons and found variability across years. Lastly, we assessed what factors govern interannual variability by calculating an index of overlap, called Volume of Intersection, of a pack's territory between years (fig. 2) and relating it to several features that can change among years, such as weather conditions, pack size, litter size, leadership (i.e. which wolves were the alpha pair), competitor (wolf) density, prey density. Is wolf habitat selection variable and, if so, what causes that variability? We concluded that wolf habitat selection does change among seasons, even though the difference between summer and winter is greater than the difference between early winter and late winter. In summer, wolves only selected habitat based on distance from roads. In winter, wolves have a tendency to avoid steep slopes, high elevations and to prefer intermediate distances form roads. Wolf habitat selection changes considerably among years, as we found very different results when analyzing a 10-year dataset and a 3-year dataset. The index of interannual territory overlap indicated that for some packs the extent of their territory boundaries and the intensity of use of their territory overlapped between years by only 9 % (fig. 1). On the contrary, other packs were much more consistent in their use of the territory and they reached overlap values of 81 %. In winter, territory overlap was explained mainly by precipitation and pack size. In summer, litter size and leadership play a small role, but differences among packs were the most important driver. In other words, in summer some packs are more consistent than others in their use of the territory. The results of our study have huge implications for habitat selection studies, because they demonstrate that wildlife habitat selection is very variable and results derived from short-term studies may not be representative of the range of habitat selection patterns that characterize a species under variable conditions.